If you work, live or travel in areas outside cellular coverage or in areas with inadequate landline service, our Satellite Telephone options are for you. Eighty-six percent of the world's landmass and all of its oceans are in areas with inadequate landline service. Satellite phone addresses these situations by providing coverage in all ocean areas, air routes and all landmasses - even the Poles. 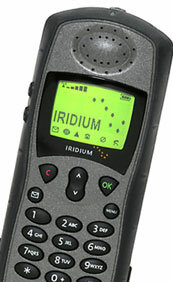 The Iridium system provides true global voice services by covering areas that cellular and landline do not. Voice services are supported using the 9500 handset or the smaller, lighter 9505 handset. The excellent signal strength provided by the Iridium constellation supports reliable connectivity across wide ranging landscapes and situations. Every inch of the planet is covered by Irdium's constellation of 66 satellites. Business, adventure, or pleasure, you can stay in touch across seas and time zones, in remote locations and on the go. One telephone number, through the use of a mini personal subscriber identity module (SIM) card, can help keep you connected anywhere on the planet. Thuraya offers quality dual-mode terminals that offer satellite and GSM connectivity. This flexibility ensures continuous and cost-effective roaming for users. Essentially, Thuraya subscribers would continue using their national land-based mobile network, but will be able to automatically switch to Thuraya satellite mode in areas that are outside the terrestrial system. Another advantage is that outside Thuraya’s coverage area, subscribers would still have the convenience of roaming in other GSM networks areas. This combination of advanced and flexible system designs ensures reliable, global mobile services to subscribers.